The present text-book is a new-modeling and rewriting of Swinton's Word-Analysis, first published in 1871. It has grown out of a large amount of testimony to the effect that the older book, while valuable as a manual of methods, in the hands of teachers, is deficient in practice-work for pupils. This testimony dictated a double procedure: first, to retain the old methods; secondly, to add an adequate amount of new matter. Accordingly, in the present manual, the few Latin roots and derivatives, with the exercises thereon, have been retained—under "Part II. : The Latin Element"—as simply a method of study. There have then been added, in "Division II. : Abbreviated Latin Derivatives," no fewer than two hundred and twenty Latin root-words with their most important English offshoots. In order to concentrate into the limited available space so large an amount of new matter, it was requisite to devise a novel mode of indicating the English derivatives. What this mode is, teachers will see in the section, pages 50-104. The author trusts that it will prove well suited to class-room work, and in many other ways interesting and valuable: should it not, a good deal of labor, both of the lamp and of the file, will have been misplaced. To one matter of detail in connection with the Latin and Greek derivatives, the author wishes to call special attention: the Latin and the Greek roots are, as key-words, given in this book in the form of the present infinitive,—the present indicative and the supine being, of course, added. For this there is one sufficient justification, to wit: that the present infinitive is the form in which a Latin or a Greek root is always given in Webster and other received lexicographic authorities. It is a curious fact, that, in all the school etymologies, the present indicative should have been given as the root, and is explicable only from the accident that it is the key-form in the Latin dictionaries. The change into conformity with our English dictionaries needs no defense, and will probably hereafter be imitated by all authors of school etymologies. 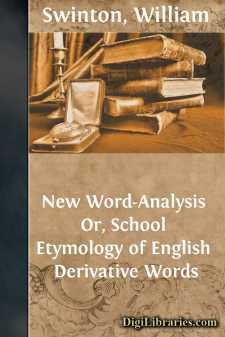 In this compilation the author has followed, in the main, the last edition of Webster's Unabridged, the etymologies in which carry the authoritative sanction of Dr. Mahn; but reference has constantly been had to the works of Wedgwood, Latham, and Haldeman, as also to the "English Etymology" of Dr. James Douglass, to whom the author is specially indebted in the Greek and Anglo-Saxon sections.